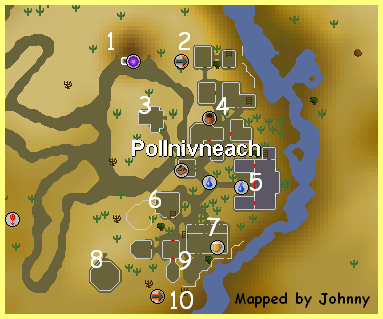 Pollnivneach is a medium sized city located in the Kharidian Desert. The city is a Bandit and Menaphite Thug ridden area and also features in many quests. 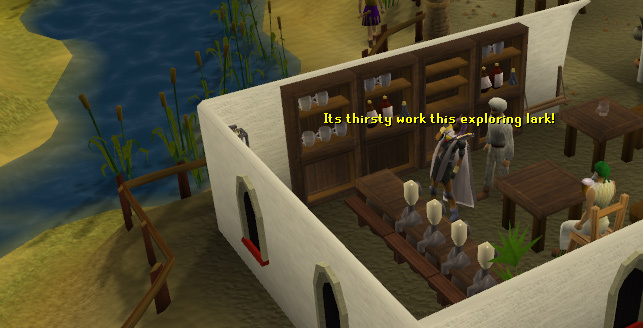 Some of the main attractions include a POH Portal, two Rug Merchants, a Pub, a Snake Charmer and more! This is, by far, the fastest way to get to Pollnivneach, although it will cost you some money to do. 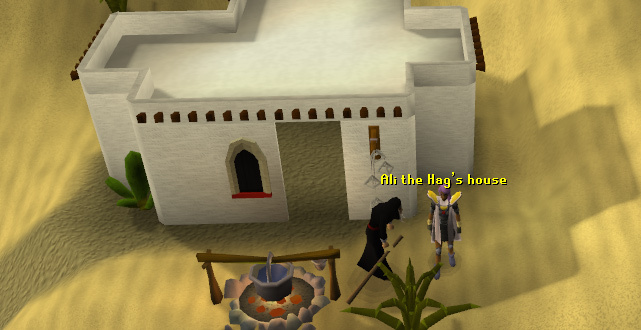 Firstly, you'll need to talk to the Rug Merchant near the Shantay Pass in Al Kharid. 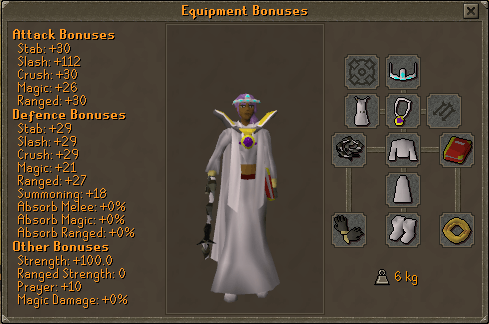 He will charge you 200 gp for a journey if you don't have a Ring of Charos (a). If you do have one, the price will be cut to 100 gp. If you're a regular user of the carpets, you will be allowed to travel for 75 gp with a Ring of Charos (a). If that isn't enough, if you have completed the Rogue Trader Activity the price is further cut! You cannot have a weapon in your right hand during travel on the carpets. This is the most time and waterskin consuming method of getting to Pollnivneach. Once you get through the pass, you'll need to walk southeast. Also, you could go south until you reach the Desert Mining Camp, then go south east until you reach civilization. Just to remind you, you will need more waterskins for this method. To use this method, you need the Camulet that is obtained from Enakhra's Lament quest as a reward. Your Camulet needs to have charge. 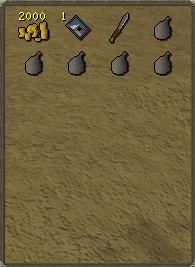 You can charge your Camulet by using it with Camel dung, obtained in Pollnivneach. 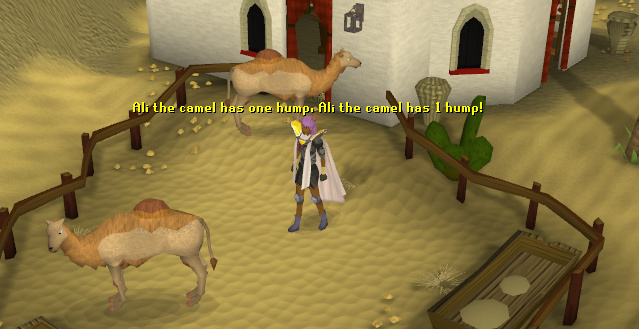 You can also get camel dung by talking to a Camel in Al Kharid whilst wearing a Camel Speak amulet. When you teleport to the Temple, get out via the exits found around the Temple. From the Quarry, go directly east and you will arrive at the south end of Pollnivneach. You will need some waterskins to use this method. This method is simple, cast the Teleport to House spell and then exit via your house portal. When you exit, you will be outside Pollnivneach. Not a lot, if any, waterskins are needed for this method. Pollnivneach has many attractions, that make the city an exciting place. All will be explained in detail here. Each attraction has a number which identifies it. This portal gives you access to your Player Owned House if you have it located in Pollnivneach. If your friend has a house in Pollnivneach, you can enter it here. To have your house placed here you need a Construction level of 20. You can move your house here by talking to any Estate Agent. 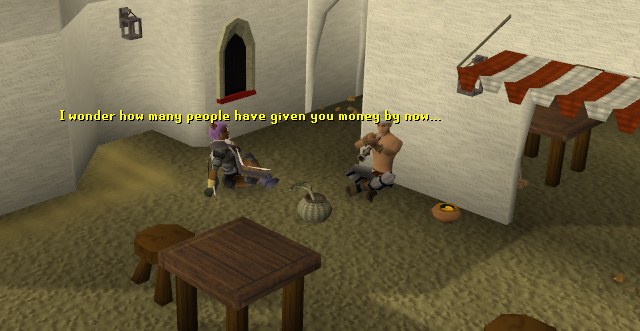 He will move your house for a fee of 7500 gp. This is the place you will arrive at if you took a magic carpet from the Shantay Pass. NPCs in this area include the Rug Merchant and his Monkey. 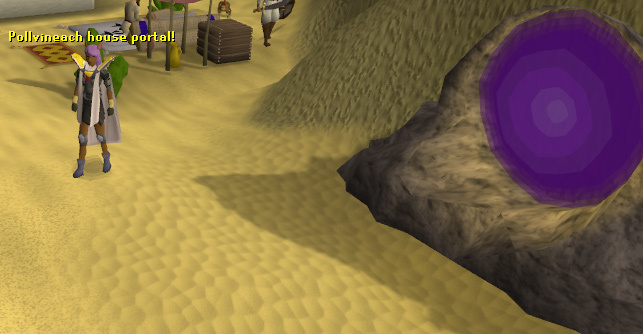 You can speak to the monkey if you have the M'Speak amulet from the Monkey Madness quest. The Merchant will let you travel back to the Shantay Pass. This area is located up a steep hill, which overlooks Pollnivneach. Hunchback Ali the is featured in The Feud quest. The grumpy woman helps you make poison out of camel dung, but be careful not to get turned into a frog! Her house contains only a bed and some shelves. This small area features of four houses and a General Store, which is run by the Market Seller who is near the stall. The northeastern house contains Bandits and upstairs there is a level 3 Villager, which can be pickpocketed, lured, and knocked out. You can knock him out using a Willow blackjack. In the northwest tent are beds and another Bandit, and in the southwest tent there are more Bandits and Villagers. This is the Mayor's house. This house is featured in the The Feud quest. Outside the house is a fountain, which can fill your vials and buckets for whatever reason. When you are on the bottom floor inside the house, there isn't much to see apart from some tables and chairs, and a portrait. As you head upstairs and go into the bedroom you will see a massive bed. Next to the bed is a safe, which is disguised as a landscape. Search the portrait and you will find a safe. Also in the room are some empty cupboards and a golden cage. To the south is a bathroom, which includes a bathtub, bath pipes, some privacy screens and all! To the west you will head out to a roof balcony, which overlooks the city. These camels are a feature in The Feud quest. In the area are two Ali the Camels, and Ali the Camel Man. In his house are two bucket respawns. Upstairs there are a few cages and a roof balcony. The funny thing here is that if you use a bottle of red hot sauce with the Camels' trough, they will produce camel dung, which you can pick up with a bucket! 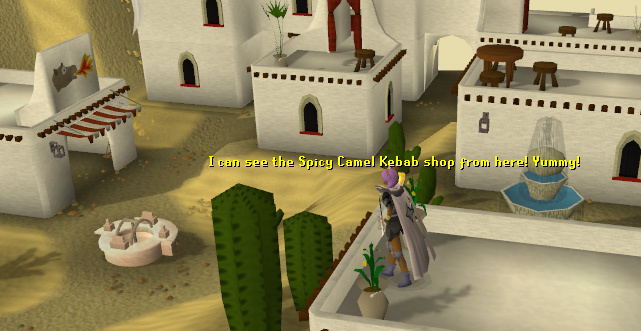 The Kebab shop is used in The Feud quest, and sells two types of kebabs as well as some Red Hot Sauce. Slightly north of the Kebab Shop is the Blackjack Seller. He owns a Blackjack stall and sells Willow Blackjacks. This is one of the main features in Pollnivneach. This bar itself is called "The Asp and Snake." It contains Drunken Ali and Ali the Barman. Ali the Barman's shop sells a variety of beverages. You may also find a level 3 Villager and some Menaphite Thugs walking in and out. 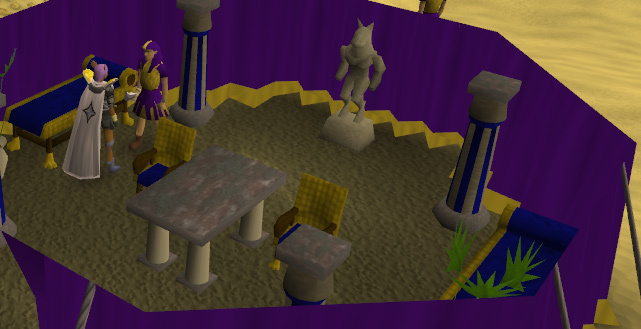 On one of the tables is a beer that is poisoned during The Feud quest. On the other table is a beer glass, which can be taken. This tent belongs to the Menaphite Gang. They are featured in The Feud quest. Inside the tent is a fancy table, two chairs and chaise lounge. NPCs include some Desert Snakes, Ali the Operator, some Villagers, some level 21 Jackals, and some level 55 Menaphite Thugs. 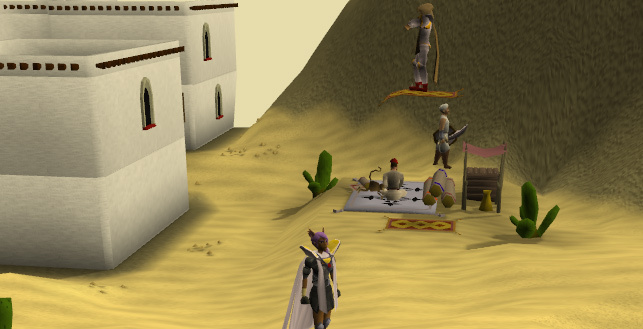 This small area contains Ali the Snake charmer, who is featured in in The Feud and the Rat Catchers quests. He will give you a "Snake charmer starter kit" if you put money in his money pot, which is next to him. In the garden are a few tables, stools and a tropical tree. This area isn't much different from the northern Rug Merchant's area. 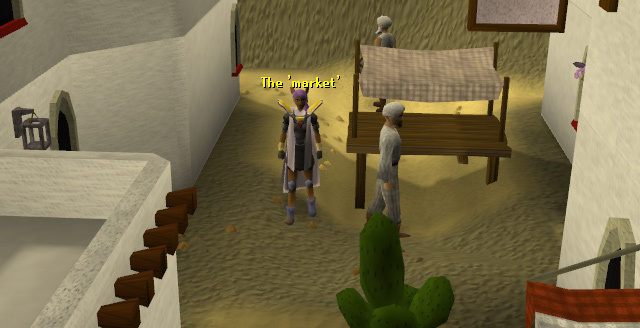 The only difference is the areas that this merchant lets you travel. 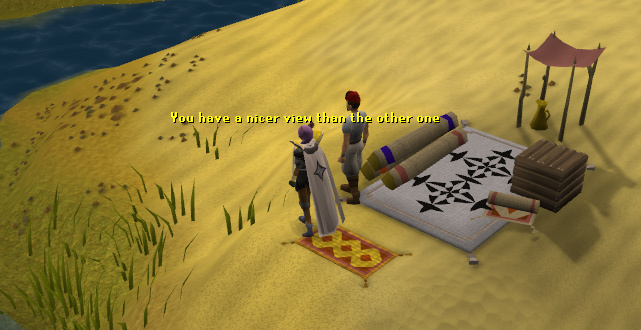 This merchant can let you travel on his carpets to Sophanem and Nardah. 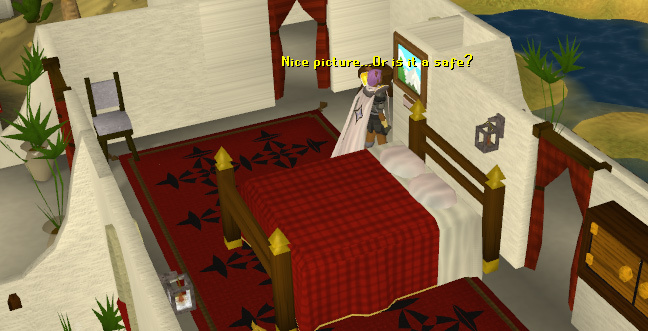 You can talk to the Monkey using the M'Speak amulet obtained from the Monkey Madness quest.